This is an indulgent recipe and works absolutely wonderfully as a very sweet end to a delicious dinner party. Place the apples and mixed berries in a pan with the caster sugar, orange rind and juice. Bring to a simmer, then cover and cook gently for 5 minutes until the fruits are tender but still holding their shape. Remove from the heat and leave to cool. Sift the plain flour into a bowl and stir in the granola. Rub in the butter until the mixture resembles breadcrumbs, drizzle with a little honey. Divide the cooled fruit mixture among the ramekins and sprinkle the crumble on top. 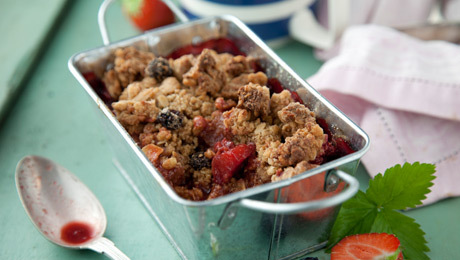 Arrange on a large baking sheet and bake for another 20-25 minutes until the crumble topping is crisp and golden brown. To serve, arrange the crumbles on serving plates and serve with some warm custard.